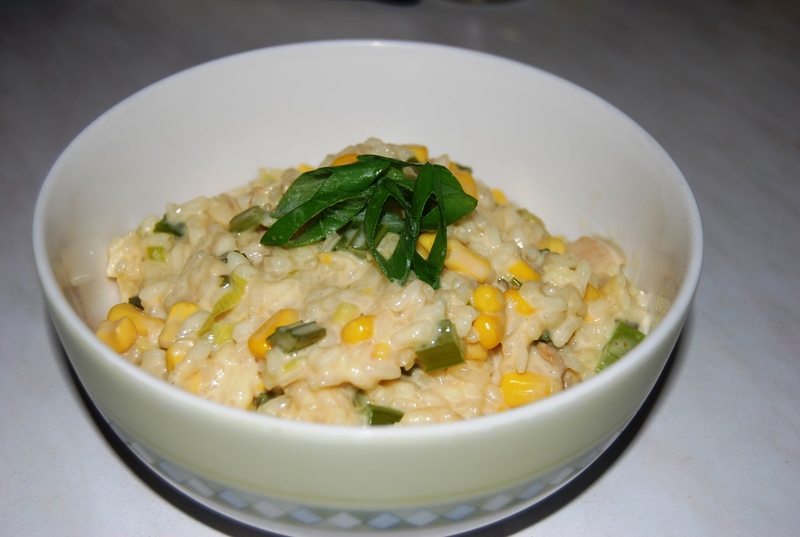 Risotto is an ideal one pot dish that can be modified to suit many tastes. In this recipe reduced fat evaporated milk is used to give a creamy consistency without the fat. Add celery and cook for a further 2 minutes. Add the chicken and stir through. Cook until chicken has slightly browned. Add the rice to the pan and stir through. Allow the rice to coat the mix and start to heat through. When the rice starts to look a little translucent gradually add all of the chicken stock whilst stirring. Allow to simmer for 10 minutes stirring regularly until the rice has absorbed the stock. Add the corn and evaporated milk and stir through. Simmer for a further 10 minutes until the rice has absorbed the remaining liquid and has become tender. When the rice is just cooked (al dente), take the frypan off the heat and stir in the parmesan cheese. Serve immediately with pepper to taste.